FDA categorizes medical devices into one of three classes (Class I, II, or III), based on their risk to patients or users. 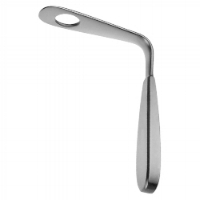 If you have ever been to a talk about US regulatory affairs, you might have heard that tongue depressors are a classic example of a Class I medical device. (FDA even uses them as an example in their "Classify your Medical Device" webpage.) They sound so harmless and mundane, but they are actually regulated by FDA. And that makes sense when you realize this device comes into contact with a mucosal membrane and sometimes is sterilized before use. So when your child brings home their 4th of July art project made of little wooden sticks, you’ll instantly appreciate the double meaning: FDA regulated medical devices that are safe and effective are super patriotic! Happy 4th of July! Photo from www.twelvemonthsoffun.com. Class I medical devices are considered to be low risk and are subject to the least regulatory controls. Tongue depressor manufacturers are exempted from any premarket notification before marketing their devices in the US. However, they are not exempt from other general controls. For example, medical devices must be manufactured under a quality assurance program, be suitable for the intended use, be adequately packaged and properly labeled, and have establishment registration and device listing forms on file with FDA. Let’s open up and say “AHHH” to better understand tongue depressor regulations. FDA databases reveal two distinct product classifications for these devices. The first one (product code FMA, under 21 CFR 880.6230) is specific to tongue depressors. The single use, in bulk or in individual sterile packaging, plastic or wooden sticks fall into this regulation. The second classification (product code KBL, under 21 CFR 874.4420) concerns ear, nose and throat manual surgical instruments. This latter regulation applies to metal tongue depressors. Tongue depressors: wooden sticks vs metal surgical instrument. Metal tongue depressors must be manufactured following Good Manufacturing Practices (GMPs) as they are designed to be reused (i.e. they are cleaned and sterilized after each use). Alternatively, the single use devices are exempt of the GMP regulations as long as they are not labeled or represented as sterile. This brings up a good point about claims and labeling, since your child likely used “craft sticks” in their art project instead of “tongue depressors.” As soon as a company labels their wooden stick as a medical device, they'd better register with FDA! A "Craft Stick" is not a "Tongue Depressor" as their intended uses are quite different! So! What did we learn about this simple yet important medical device example? First, FDA’s regulations are quite precise, since two distinct classifications exist for devices used to “push down the tongue”. And second, it is rather comforting to know that even these simple disposable wooden sticks or metal depressors that are entering our mouths almost every time we visit our doctor’s office, are regulated and safe for their intended use. Newer PostMed Device Monday: Cool Ones! Older PostMed Device Monday: Dentures!